The economy of Vientiane grew at an annualised rate of more than 10 percent over the past six months, yet the implementation of targets for making the capital an increasingly liveable city has seen slower progress, the city’s Mayor told councilors gathered in the capital. More than 100 families in 10 villages of the newly relocated Kaleum district in Sekong Province are expected to have access to electricity by the end of this year. Lao government officials and development partners met Wednesday in capital Vientiane to discuss medium term priorities for trade and private sector development in the country. Ministry of Finance has pledged to investigate an issue in which an importer alleged tax officials in a northern province charged him a much higher tariff than indicated on the receipt. The government has spent over 1 trillion kip (about US$120 million) on the construction of new infrastructure in Xone, a new district in Huaphan province. The roles of the Ministry of Planning and Investment and Ministry of Finance have been clearly defined to deal with government debt repayments, a senior official has confirmed. 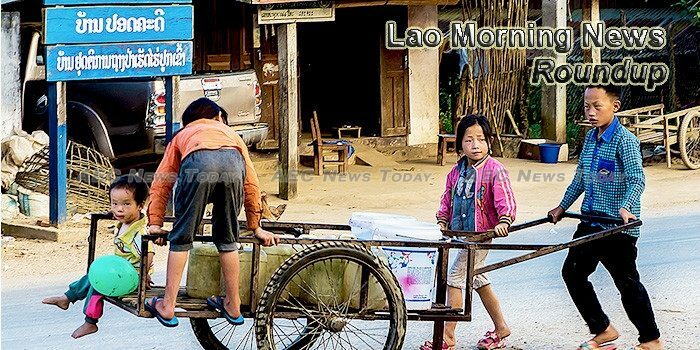 The European Union (EU) has agreed to approve more than 570 billion kip (62 million EUR) to help Laos achieve Sustainable Development Goals (SDGs), especially in education. Chairman of the Planning, Finance and Audit Committee of the Lao National Assembly Vilayvong Budakham hoped the central province of Quang Nam will continue increasing cooperation with Lao localities. A temporary pause in flights to Oudomxay Airport to upgrade the runway surface and its apron should not cause undue trouble for passengers to and from the nation’s north over the next few months, an official has said. Regional experts are gathering in Lao capital Vientiane to discuss the control and elimination of malaria in the Greater Mekong Subregion (GMS) by 2030 at a three-day workshop being held from Wednesday to Friday. Youngsters from across Laos are currently participating in a talent based “sport school” organized by Lao National Sports Training Center in capital Vientiane from Monday this week to next Wednesday.